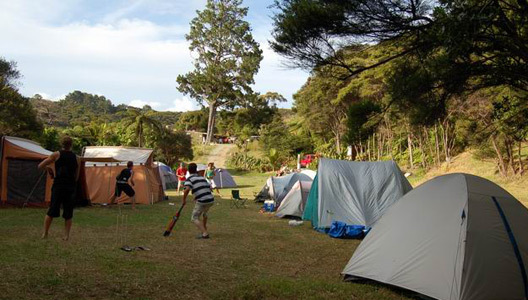 During the summer months camping in tents becomes popular on Great Barrier Island with many people keen to camp under the stars in tents ranging in style from tiny to large. Last summer a camping couple stayed with us in a tent equipped with its own beer fridge and gazebo! Camping is $18.00 per night, per person. Camping guests share the kitchen, showers, and toilets at the adjacent backpackers accommodation lodge. Tents in our campsite are located close to all the facilities with room for approx. 14 tents.